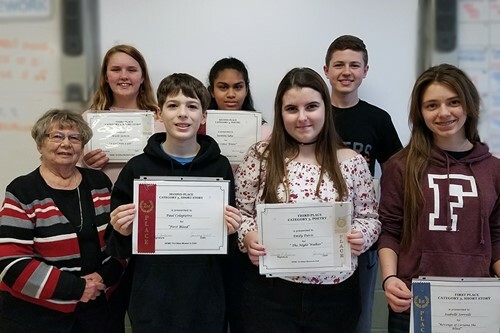 Students from JFS swept both the short story and poetry competitions in the 2019 Tri-Cities Woman’s Club Writing Contest. Winning the short story competition was Isabelle Sorrells with “Revenge of Coriana the Blind,” a horror story set in a school that is allegedly haunted by the ghost of a student who perished in the school’s bathroom. The story’s theme is that fear can keep students from the knowledge they need to become successful adults. Taking second place was Paul Colapietro, with his story “First Blood,” which portrays the struggles of a family during difficult economic times. In third place was Arielle Jackson, with her story “A Girl with a Gift,” concerning the problems one girl encounters as she tries to navigate her way through high school. In the poetry competition, Luke Pylypciw took first place with “Where History Was Made.” This poem details all the famous baseball players who have played in Yankee Stadium, using them as a metaphor for our society’s obsession with athletic success. Susmita Saha placed second, with her poem “Here Comes Winter,” an extended metaphor on the hardships of the human condition. Taking third place in the contest was Emily Davis with her poem “The Night Walker,” which addresses the type of depressing moments any teenage girl can suffer, and how the love of a caring mother can help. This competition is between writers from Union-Endicott, Vestal, and Maine-Endwell. The first place stories and poems move on to the district competition.